Located on ”The Scenic Byway” in The Village Of Oak Creek just a few minutes outside of the city of Sedona in Northern Arizona, lies Sedona’s only B&B on a golf course the Adobe Hacienda – a marvelous jewel among boutique Inns in Arizona.Located in a relaxed rural setting on 1.3 acres, the warmth of Southwestern hospitality offers Sedona’s most authentic Southwest-style Inn experience.The property includes a luxury 3 bed/2bath caretaker’s quarters & is designed to stay in theme with the rich indigenous adobe architecture. 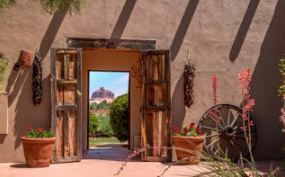 Guest rooms are of peeled lodge poles, 100-year-old Oaxacan doors, authentic Saltillo tile, kiva fireplaces & hand-painted Mexican sinks, the property features 6 guest rooms including a new, separate, luxury Casita with broad windows to accentuate the panoramic red rock & golf course views. We are also your premier choice for accommodations among Grand Canyon bed & breakfasts as the perfect base for an easy day trip. The current operations provide a full gourmet breakfast. Guests can relax on their red rock view patio or enjoy Sedona star gazing at an outdoor fireplace, hike at nearby Cathedral Rock or Bell Rock & golf Sedona Golf Resort. Accommodations are situated for privacy each with easy access to on-site meeting room & breakfast area, gorgeous stone paths lead to patios with sparkling fountains & fireplace tucked among lush landscaping. Off property is a golf resort & spas are nearby. All rooms feature rich warm colors & offer either mountain or golf course views which are especially break taking at sunset. Tours & financials available for pre-qualified buyers.